Hot hot Onion Rava Uttapam with tiffin sambar and lipsmacking chutneys …makes everyone’s mouthwatery..! Yes Today I will share the recipe of South Indian style rava onion uttapam. The recipe is absolutely quick and easy to prepare and tasty too. This..
delicious and spicy dish can be enjoyed as a snack or nutritious breakfast..!.. 1. In a mixing bowl, add rava/sooji, rice flour and mix. 2. Add yoghurt and salt. 3. Add little water and stir well. 4. Cover and let it rest for 30 mins. 5. Mix well and add little water as the sooji has absorbed water and puffed up. 6. The batter consistency should be smooth pouring consistency. 8. Add cumin seeds, sliced onions, green chillies, hing and saute for a minute. 9. Pour it to the batter and combine. 10. Heat the tava / dosa gridle and grease oil on it. 11. Take one ladleful of batter and pour it on hot tava and spread it to concentric circles. 12. Drizzle oil/ghee to the sides. 13. Cover and cook for 2 minutes. 14. When one side is cooked golden, flip it to other side and wait till it is cooked crisp on this side too. 16. Transfer it to serving plate. 17. 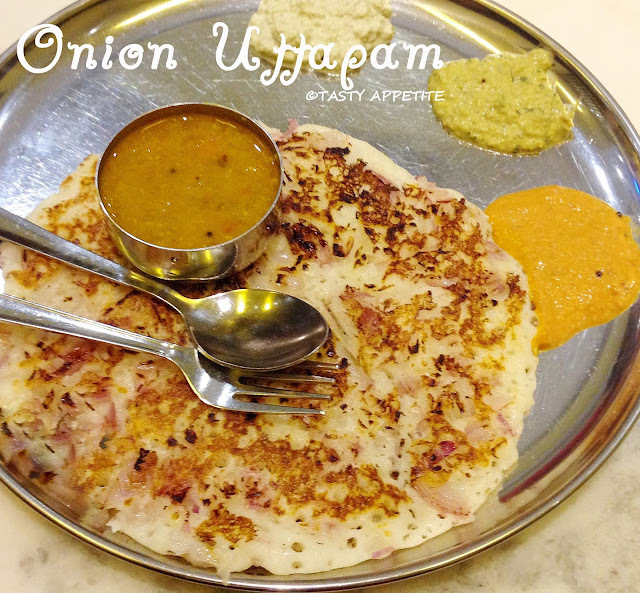 Crispy hot and spicy onion rava uttapam is ready. 18. Enjoy with veg sambar & yummy chutneys.